Pilar tumor of the scalp (also known as proliferating pilar/trichilemmal cyst) is a rare benign locally aggressive skin adnexal tumor arising from the hair follicle outer root sheath., Proliferating trichilemmal cyst, though uncommon, predominantly occurs in the scalp, trunk, head, and neck, and females are more commonly affected.,, It is rarely seen in the extremities, and malignant transformation is a rarity. Due to the rarity of malignant transformation, only a hand full of cases has been documented in literature. 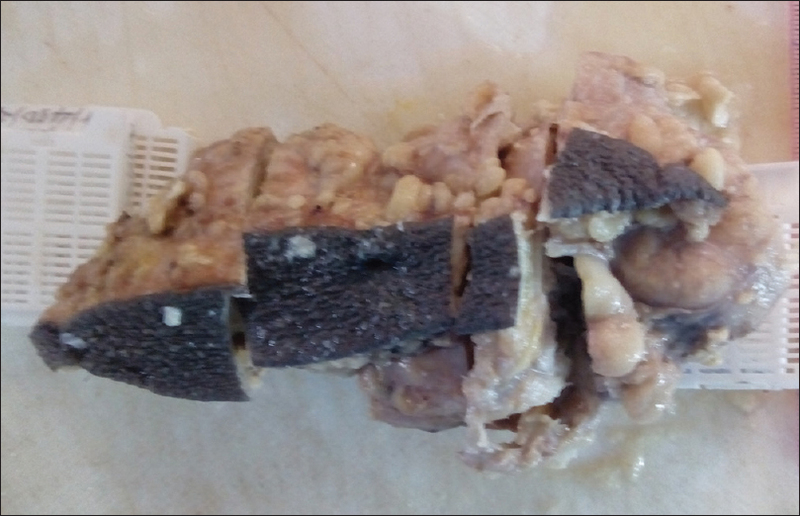 We present an unusual case of gluteal malignant proliferating pilar tumor in an elderly male. A 69-year-old well-nourished elderly male presented to a private hospital with a 10-year history of progressive swelling of the left buttock. There was no antecedent history of trauma or surgery to the site of swelling, which became painful a couple of months before presentation at the private hospital. He also complained of rapid increase in the size of the swelling in the past 2 years preceding hospital presentation. There were no other visible or palpable swellings on his body. He had no significant past medical history or constitutional symptoms suggestive of any systemic diseases. Clinical examination of the left buttock showed a circumscribed firm gluteal mass measuring 12 cm × 8 cm and adherent to the underlying structures and inferior margin of the gluteus. The mass was covered by intact skin. There were no palpable masses in the groin or anywhere else. A clinical impression of gluteal lipoma was made, and an excisional biopsy was sent to the pathology laboratory for analysis. Grossly, we received an irregular lobulated cystic mass with an attached skin; the specimen measured 13 cm × 8 cm × 6 cm and weighed 158 g [Figure 1]. Cut surfaces of the mass revealed a cystic cavity with gray thickened wall containing friable materials. Other areas on the cut surfaces were gray and homogenous [Figure 2]. 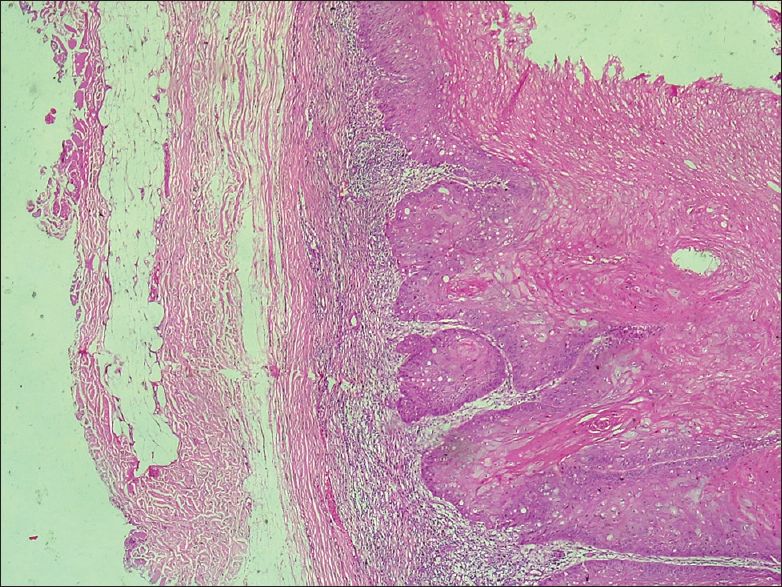 Microscopic examination showed a keratinized skin overlying a deep dermal cyst lined by keratinized stratified squamous epithelium. The cyst contained lamellated keratin within the cyst cavity. 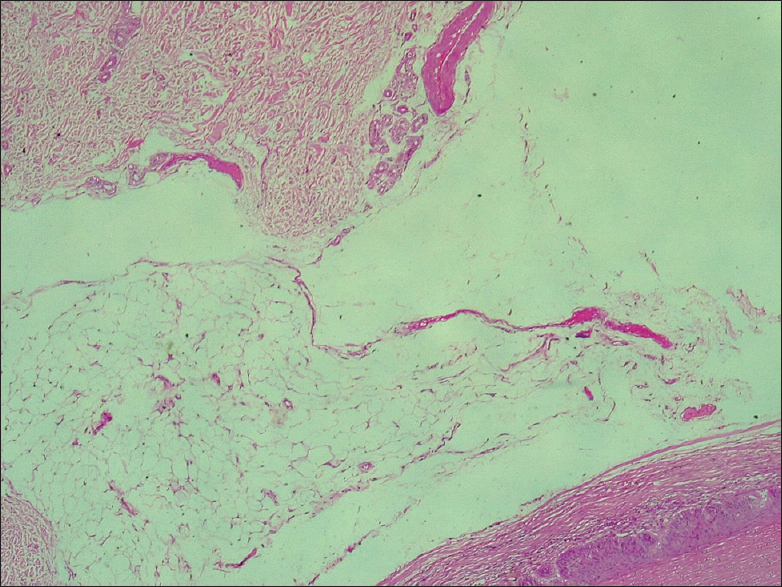 An infiltrative well-differentiated tumor arrayed in nests, trabeculae, and small sheets which arose from the wall of the cyst. It was composed of malignant polygonal cells having hyperchromatic nuclei with 1–2 nucleoli and a moderate amount of amphophilic cytoplasm admixed with clear cells, central keratin formations, multinucleate giant cells, and abnormal mitotic figures [Figure 3] and [Figure 4]. The deep resection margins are involve by tumour [Figure 5]. 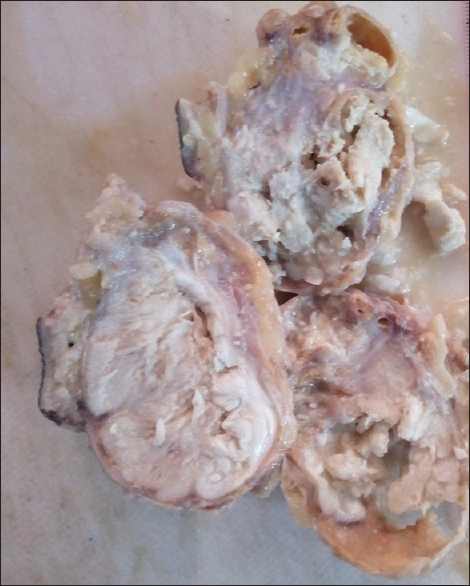 A diagnosis of malignant proliferating pilar (trichilemmal) tumor with surgical margin involvement was made. Malignant proliferating pilar (trichilemmal) tumor is a rare malignant skin adnexal tumor of hair follicle origin and was recognized by Saida et al. in 1983 as a distinct entity arising from an uncommon benign pilar tumor or proliferating trichilemmal cyst of the scalp. The benign counterpart was first described by Jones in 1966 as proliferating epidermoid tumor and it predominantly affects middle aged to elderly females with a male-female ratio of 6:1 and has a predilection for the scalp.,,, However, other sites of involvement, particularly, terminal hair-bearing regions of the body have been documented in literature., It often presents as a solitary multinodular deep dermal tumor which may extend to the subcutaneous tissue and has an average size of 5 cm though ranges from 2 to 10 cm. Malignant transformation was highlighted by Headington and is often associated with lesions >6 cm in size, rapid growth, surface ulceration, and locations other than the scalp.,, Our patient is male and presented with a 13 cm gluteal mass with associated pain and rapid growth in the past 2 years before presentation. Although he presented a lump in the buttocks of 10-year duration, it was the sudden rapid increase in size that prompts him to seek medical attention. An impression of lipoma was made by the attending surgeon. Definitive diagnosis is achieved by tissue biopsy and identification of a deep dermal trichilemmal cyst in continuity with an infiltrative malignant tumor exhibiting marked cytologic atypia, with numerous mitotic figures including abnormal ones. Other diagnostic tools include the use of fine needle aspiration cytology(FNAC), though this may not be reliable or diagnostic. Immunohistochemistry using CD34 antibody marker has also been employed, but this is also not diagnostic by itself. There is no standardized treatment modality for malignant proliferating pilar tumor. Complete surgical excision may suffice in the absence of nodal or distant metastasis. The use of chemotherapy and/or radiotherapy has been advocated in tumors with metastasis, but it is still subjective and reliant on individual patient tumor extent. Mann et al. and some similar studies have reported that clinically aggressive tumors are associated with nodal or distant metastasis.,,, Our patient had surgical excision though the tumor extended to the margin. Incompletely excised tumors are fraught with recurrence and high risk of metastasis. There was no demonstrable nodal involvement in this patient as there were no palpable swellings or nodules. Patient has not agreed to another surgical exploration due to the diagnosis of incomplete excision. Malignant proliferating trichilemmal tumor is rare and poses a diagnostic dilemma for the pathologist, especially in the resource-constraint environment. It has also been documented that the tumor has high tendency to recur especially if not completely excised and metastasize more frequently than squamous cell carcinoma. Wide surgical excision should be considered as the first-line modality of treatment, while alternative therapies require further evaluation and individual health facility protocol. Janitz J, Wiedersberg H. Trichilemmal pilar tumors. Cancer 1980;45:1594-7. Holmes EJ. Tumors of lower hair sheath. Common histogenesis of certain so-called “sebaceous cysts,” acanthomas and “sebaceous carcinomas”. Cancer 1968;21:234-48. Brownstein MH, Arluk DJ. Proliferating trichilemmal cyst: A simulant of squamous cell carcinoma. Cancer 1981;48:1207-14. Saida T, Oohara K, Hori Y, Tsuchiya S. Development of a malignant proliferating trichilemmal cyst in a patient with multiple trichilemmal cysts. Dermatologica 1983;166:203-8. Jones EW. Proliferating epidermoid cysts. Arch Dermatol 1966;94:11-9. Markal N, Kurtay A, Velidedeoğlu H, Hücümenoğlu S. Malignant transformation of a giant proliferating trichilemmal tumor of the scalp: Patient report and literature review. Ann Plast Surg 1998;41:314-6. Headington JT. Tumors of the hair follicle: A review. Am J Pathol 1976;85:480-514. Park BS, Yang SG, Cho KH. Malignant proliferating trichilemmal tumor showing distant metastases. Am J Dermatopathol 1997;19:536-9. Ye J, Nappi O, Swanson PE, Patterson JW, Wick MR. Proliferating pilar tumors: A clinicopathologic study of 76 cases with a proposal for definition of benign and malignant variants. Am J Clin Pathol 2004;122:566-74. López-Ríos F, Rodríguez-Peralto JL, Aguilar A, Hernández L, Gallego M. Proliferating trichilemmal cyst with focal invasion: Report of a case and a review of the literature. Am J Dermatopathol 2000;22:183-7. Yotsuyangi T, Urushidate S, Yokoi K, Sawada Y. A malignant proliferating trichilemmal tumour, simulating squamous cell carcinoma. Eur J Plast Surg 1997;20:320-2. Kini JR, Kini H. Fine-needle aspiration cytology in the diagnosis of malignant proliferating trichilemmal tumor: Report of a case and review of the literature. Diagn Cytopathol 2009;37:744-7. Chaichamnan K, Satayasoontorn K, Puttanupaab S, Attainsee A. Malignant proliferating trichilemmal tumors with CD34 expression. J Med Assoc Thai 2010;93 Suppl 6:S28-34. Mann B, Salm R, Azzopardi JG. Pilar tumour: A distinctive type of trichilemmoma. Diagn Histopathol 1982;5:157-67.